SilcoTek hereby announces that it has resolved its patent litigation with Entech Instruments, Inc. pending in the Central District of California. SilcoTek filed suit in November 2015 against Entech alleging patent infringement of U.S. Patent No. 6,511,760, relating to passivating gas storage vessels with multiple layers of silicon. SilcoTek agreed to settle the suit upon Entech agreeing to enter into a license agreement for U.S. Patent No. 6,511,760 paying a reasonable royalty for the time period December 2015 through July 2017, and Entech pledging it will not coat gas storage vessels through multi-layer silicon deposition through the patent term, which expires on February 26, 2019. The case is SilcoTek Corporation v. Entech Instruments, Inc., 2:18-cv-03274-SJO-PLA. SilcoTek remains committed to protecting its intellectual property, and is receptive to licensing opportunities. To view more information about such licenses, click here. SilcoTek was interviewed for the October 2018 Business in Focus magazine. SilcoTek is proud to tell our story in the October 2018 edition of Business in Focus. We talk about the growth that we anticipate in the coming months and years, our innovative technology, and what makes SilcoTek so unique. Visit the Business in Focus website to read the article and learn more about the company and our vision. 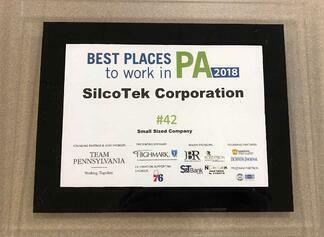 SilcoTek has been named one of the Best Places to Work in PA for 2018. The awards program, created in 2000, is one of the first statewide programs of its kind in the country. Companies from across the state entered the two-part process to determine the 100 Best Places to Work in PA. SilcoTek was recognized at the Best Places to Work in PA awards banquet on Thursday, November 29, 2018, at the Lancaster County Convention Center in Lancaster, PA. Out of all the participating small sized companies, SilcoTek was ranked #42. This survey and awards program was designed to identify, recognize, and honor the best places of employment in Pennsylvania, who are benefiting the state's economy and workforce. We are excited to be recognized for this award and pride ourselves in our employees enjoying coming to work as much as they enjoy going home. State Rep. Mike Hanna, D-Clinton/Centre, today announced that SilcoTek Corporation received $82,585 in tax credits through the Department of Community and Economic Development’s Keystone Innovation Zone (KIZ) program. Click here to read the full article on Representative Hanna's website. 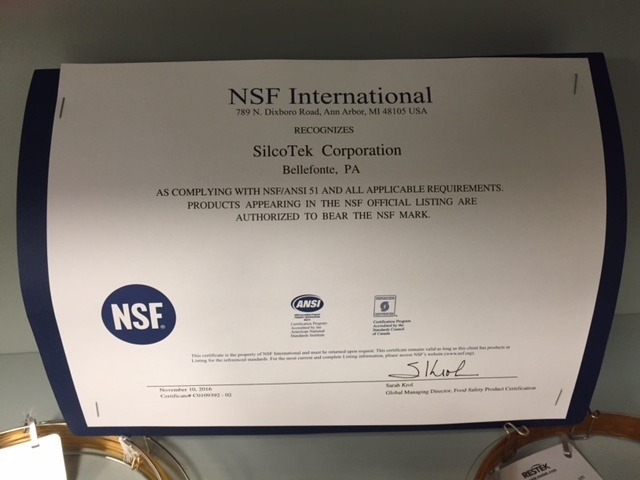 SilcoTek® has received certification by the National Sanitation Foundation (NSF) for their Dursan® coating. The coating complies with NSF/ANSI 51 requirements for food contact and is therefore also FDA compliant. This certification strengthens the company's position in penetrating key growth markets for coatings, such as medical and pharmaceutical. Dursan provides advanced surface properties such as anti-sticking and corrosion resistance that are critical to manufacturers in these industries. Click here to view our NSF registration online. SilcoTek® announced the hiring of Geoffrey K. White as General Counsel and Chief Intellectual Property Counsel. As General Counsel, Geoff will be instrumental in helping SilcoTek reach its goals of achieving 100 patents and 100 offsite manufacturing facilities by the year 2020. Read more. SilcoTek's early payback of Ben Franklin investment will fund three other startups! In 2009 Ben Franklin Technology Partners, a state-funded initiative that invests in tech-startups and small manufacturers, invested funds in the newly formed SilcoTek Corporation that would help increase SilcoTek's sales by developing a state-of-the-art facility dedicated only to coating customer-supplied parts. Today, with customers that include refineries, petro-chemical plants, and industrial, aerospace, and automotive manufacturers, SilcoTek is in the position of being able to pay off its remaining debt to Ben Franklin early. That money, a little more than $300,000, will be re-invested in three more startups located in Ben Franklin’s footprint. Read more. SilcoTek Receives Outstanding Technical Company Award. SilcoTek®, led by entrepreneur Paul Silvis, has been named the 2013 “Outstanding Technical Company” by the Chamber of Business and Industry of Centre County (CBICC). Each year, the CBICC presents the Outstanding Technical Company Award to a “chamber member that develops or implements exciting new technologies and makes them work for the betterment of business, industry and society.” SilcoTek® Corporation provides custom surface treatments to a variety of industries including refining, semiconductor manufacturing, and analytical sciences from their new 38,000 square foot facility in the Benner Commerce Park. · 100 patents on coating technologies and advancements by the year 2020. · 100 off-site processing oven installations by 2020. · $100 million in sales by 2020. About Silcotek Corporation: Once a division of Restek Corporation, SilcoTek spun-off from the parent company in 2009 to form a completely separate business. The coatings company performs a special chemical vapor deposition (CVD) of silicon-based coatings that provide chemical inertness, corrosion resistance, durability and other material advantages to otherwise under performing parts in a variety of industrial marketplaces. SilcoTek highlighted in Keystone Edge, receives Ben Franklin Technology loan. 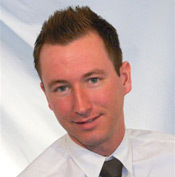 SilcoTek, is now separating itself from the competition as it continues to grow and earn industry validation. SilcoTek was formed in early 2009 behind the power of an innovative chemical-vapor deposition process, which coats metal surfaces with fused silicon. The new company took home $125,000 from Ben Franklin Technology Partners of Central and Northern Pennsylvania for marketing efforts in 2009 and another $250,000 in 2010. In response to growing demand for silicon coatings in the European Union marketplace, SilcoTek Corporation has formed SilcoTek GmbH. SilcoTek GmbH is located in Bad Homburg, Germany and will provide coating sales and customer support to customers located in Germany, Switzerland, and Austria. SilcoTek GmbH representatives will prospect for, and open new coating markets in process, analytical, gas, oil and semiconductor markets while providing sales support, logistics, order processing and customer service support to SilcoTek's growing customer base and Direct Line partners. Opening an EU office is part of SilcoTek's ongoing effort to provide Zero Disappointments, Integrity, and Plus One customer service (our ZIP Code) to coatings customers world-wide. The SilcoTek GmbH team consists of (from left) Johannes Kutt (General Manager), Michael Caspari (Marketing Manager), and Christine Kraus (Management Assistant). SilcoTek™ is pleased to announce that we have achieved certification to Quality Management System – ISO 9001:2008 from the independent auditing firm BSI America Inc. effective 1/24/2010. Registration to ISO 9001:2008 demonstrates SilcoTek's commitment to Zero Customer Disappointments and continuous quality system improvement and customer service. To view our registration, click here.